Deluxe drafting chairs for the serious artist or designer that are both comfortable and sturdy. 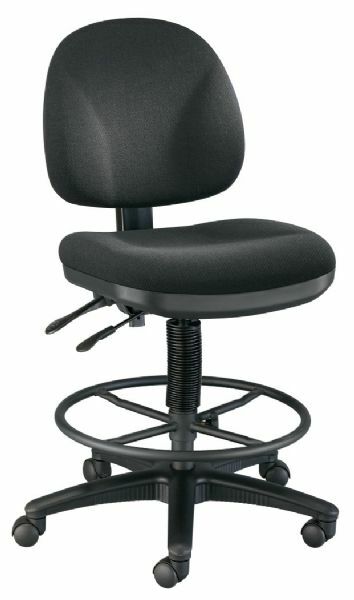 * Features include pneumatic height control polypropylene seat and back shells a height- and depth-adjustable backrest with tilt-angle control articulating seat and backrest dual-wheel casters and a 26" diameter reinforced nylon base. * Height adjustable foot ring comes standard. * Seat cushion is 19"w x 18"d x 3" thick. * Backrest is 17"w x 15"h x 3" thick. * Height adjusts from 24" to 34". It is foot ring included. The height range is 24" - 29", 30" & up. The seat material is fabric. 27" x 25" x 14"